Welcome to our web-pages about plant-growth and -resistance promoting AM fungi. Why include arbuscular mycorrhizal (AM) fungi and AM related services in your research and application? You may also ask: Which are the main challenges for humankind in the next decades? Problems in food production will perhaps become the most critical one. Within the next 50-100 years, global high quality rock phosphate reserves will deplete. The global peak P (the point of time when production starts to decrease due to resource depletion) is forecasted for 2040-2050 and the reserves of one of the biggest producers, the U.S.A., are calculated to be already depleted in 2040. Rock phosphate is the primary, but non-renewable source for large scale P-fertilization in agriculture, and currently there is no practical or theoretical alternative. Despite this, as applied in high input agricultural systems in the U.S.A. and Europe, more than 60% of the P are being wasted. The general situation is even worse, because fertile soil resources will start declining very soon - which implies that 'peak soil' and 'peak phosphorous' will most likely occur even earlier than 'peak oil'. Each of these three 'peaks' in production or availability alone might already be disastrous for our food-safety. This web site contains commercial pages offering research-grade AM fungal inoculum and research-services, particularly in quality control and quality assurance, along with pages for scientific background information. The sites are designed in a way that allows you to easily choose products, if desired. We offer in vitro produced quality of AM fungal inoculum, which allows easy setup and interpretation of experiments - and saves your time and money. Plant sciences (and several other disciplines) are intrinsically linked to AM symbioses: land plants co-evolved in close association with AM fungi - since their origin, even before plants had evolved roots. This is reflected by the strong dependency of many plants on AM fungi (such as the tropical tree species on the photograph, on the left with and on the right without inoculation with AM fungi, after 6 months). By using AM fungi, many research experiments will become biologically more meaningful. For research we offer in vitro produced AM fungi to ensure flexible setup and development of your experiments and applications, at a reasonable price. These fungi have already been successfully tested in research projects and/or applied in field experiments. In vitro ROC (root organ culture) produced AM fungi can be applied in a very controlled manner in any desired concentration. We can supply advice and guidance to basic users not yet familiar with AM research, biology, or AM fungi application. We were and are involved in a range of basic and also applied research projects. Click on the images to find out more. For references, check our up-to-date publication list. We are specialized in AM fungi characterization and quality control, including molecular biological methods, with the demands of our customers in mind. Our products are pre-designed for easy application, available in different carrier materials on request. Futhermore we are part of an extensive research network and can therefore offer state of the art AM fungi DNA-based monitoring systems. How to solve the noted problems, at least partially? This is a matter of debate; realistically however the future looks bleak. But it is increasingly becoming evident that a better understanding of the arbuscular mycorrhiza (AM) symbiosis will play a large role in (urgently needed) sustainable agricultural practices: AM is a key symbiosis for efficient P-uptake by plants. More than 80% of the land plants take up most of their needed P (and other nutrients) indirectly through symbiotic AM fungi, efficiently exploring the soil, and not by the roots themselves. In exchange, the plants supply large amounts of photosynthesis products (as sugars) to the fungi (which are a globally relevant carbon-dioxide sink). 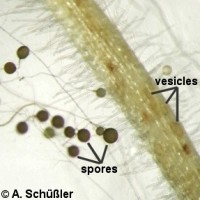 The nutrient exchange within plant root cells mainly takes place at the fungus-plant symbiotic interface formed around the finely branched fungal arbuscules, the eponymous structure of this plant-fungus symbiosis. Most plants used by humankind for food form AM (see a list of some important AM-forming plants). The 10 most important food crops for human nutrition all form AM! 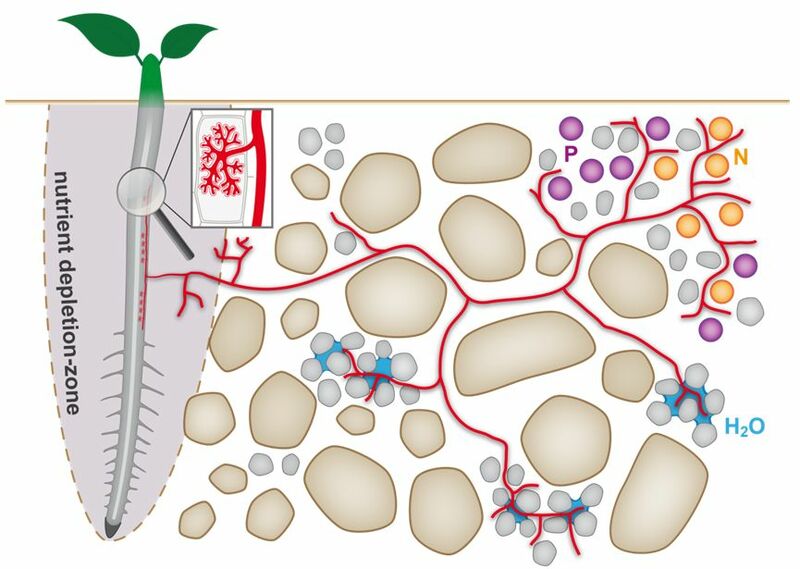 The image below shows how mycorrhizal fungi (colored in red) extend the soil volume accessible to plants, allowing a more efficient uptake of nutrients and water. To provide biological material for research, existing fungal cultures are characterised and new cultures are adapted to in vitro production. Regarding quality control (of fungal spores, cultures, or directly from products), we provide services for producers and customers. We offer DNA-based monitorings and phylogenetic analyses for producers, customers and researchers (inquire for more information). Based on NGS phylotaxonomic methods field inventories of AM fungi (from soil or roots) are offered, using high throughput MiSeq (450 bp) based amplicon-sequencing and a high quality, continuously updated reference database, using a robust bioinformatics pipeline allowing species-level resolution. View our Getting Started page. Please do not hesitate to contact us to discuss your needs. You can find additional and tutorial information on our web-pages.